What does moderation mean, exactly? Could you please explain exactly what the term moderation means? I hear all the time that we should eat certain foods ‘in moderation’ but no one ever tells us what moderation is. Is it a small amount regularly? Is it a larger amount less often? I’m really interested to hear your take on this because it seems to be a matter of opinion. One person’s moderation could be another person’s excess. I absolutely love this question…because it shows that I’ve been falling short. Like many nutrition experts, I use the word “moderation” freely but I don’t always define it. I just assume that you know what I mean. Or maybe I’m just being lazy. As Tosin so accurately points out, what may be moderate for you may be excessive for me. If you run 10-12 miles a day, you can safely consume more calories (and sugar) than someone who is sedentary. If you have high blood pressure, you will need to restrict sodium more than someone who does not. It also depends on what we’re talking about. Drinking 3-4 cups of coffee a day is pretty moderate. Drinking 3-4 martinis a day is not. 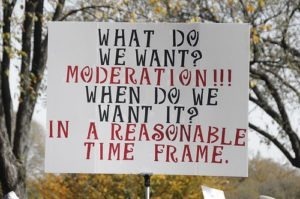 What does moderation really mean? For me, the words “enjoy it in moderation” is a sort of shorthand, meaning “Stop before you hurt yourself.” Stop before it adds up to more calories (or sugar, or alcohol, or salt) than you can tolerate without adverse effects. Stop before it creates an imbalance in your diet, or your body. This, of course, requires some self-knowledge and some awareness of basic nutritional principles. I promise I will try harder not to use the word moderation without supplying some details. In the meantime, here are some general guidelines for foods that are most likely to trigger the advice “eat it in moderation.” You can click on the links to read more.